At its heart, ChurchSuite is a web-based church database and the Address Book module, at its most basic level, serves as a repository for all your church adult contacts (which may include congregation and non-church members). In order to make use of ChurchSuite's many features, you will need to first have some contact data in the Address Book module. You can of course add new contacts through ChurchSuite at any time, but if you have a pre-existing church database, you will want to upload this to ChurchSuite in one go. Importantly, your pre-existing church data will ideally need to be divided into two files - one for adults and one for children, with each person in your data having their own separate row in the file. Each file is then imported into the Address Book and Children modules respectively. Also, when importing data to a multi-site account, the site should be specified in the data, otherwise the site you're currently viewing is the site that the data will be imported into. Make sure your address book is the right file type. To upload your church database to ChurchSuite, it needs to be in the form of a .CSV file, using a comma as the delimiter and in UTF-8 format. With Spreadsheet programs such as MS Excel or Google Docs, you are able to save spreadsheets as .CSV files in the correct format. Many 'contact management' programs let you export your data as .CSV files, but you may need to reach out to the program provider if you need assistance. If you're currently using the Microsoft Outlook address book for your church contacts and want to import it to ChurchSuite, follow these instructions for exporting the data to a CSV file, before moving on to the next step. And if you're using the Mac Contacts app for your church contacts and want to import it to ChurchSuite, you'll first need to convert Apple's native ".abbu" file format to CSV - check out this article on how to do this. Top Tip! - Text format - UPPERCASE or lowercase? When preparing your CSV file, you might consider using mixed "sentence" case formatting rather than UPPERCASE formatting, especially for first name and last name fields - in this way, when you are using ChurchSuite's communication 'merge fields' you can personalise your communications as "Dear James" rather than "Dear JAMES". Next, make sure your CSV file is the right format. To do this, open your CSV file in a Spreadsheet application like Microsoft Excel or Google Docs. Ensure that the first row contains the correct header information that ChurchSuite will use to match each field in your data with the fields in ChurchSuite. Each field should be correctly labelled e.g. first_name, last_name. A full list of the accepted fields with the relevant header information can be found at the end of this article and on the Import Contacts page within ChurchSuite. Importantly you do not have to have a column for every field - ChurchSuite will only import those fields you supply in your CSV file; however you must ensure every incoming field that your supply in your data is "mapped" to a ChurchSuite field (otherwise it won't be imported). Please note that it's not possible to import images for your contacts from within a CSV file; instead these must be uploaded against each contact profile after the data is imported - your church members can also upload their own profile images using the member-facing My ChurchSuite - see related articles. ChurchSuite will import every column from your CSV file that has a "CSV header" that it recognises. Top Tips! - What fields should be imported? You do not have to import every field in the specification below - only import those that are relevant. The minimum data required for each person is their first and last name. In your CSV file, do not use the same column header twice, otherwise one of the columns will be ignored. For tags, key dates and notes see paragraph below on 'Prefix when importing fields as Tags, Notes and Key Dates'. For date fields, it is recommended that dates are formatted in either the ISO format (yyyy-mm-dd) or your local format (e.g. UK: dd/mm/yyyy or North America: mm/dd/yyyy). What is the 'child' parameter? Children may be included in the contacts import, if the value of 'child' is entered into the column named 'child'. Not all fields associated for a child are supported if they are imported with contacts - you may therefore prefer to import children separately. Any fields classified as 'CHILD ONLY' will import the contact as a child, regardless of age. If the age is determined to be under 18, the contact will be imported as a child. Linking partners, spouses and children? After the import has been completed, the process will attempt to link spouses for contacts and parents for children. A spouse will be linked if they are 'married' and live at the same address (line 1 only). A child will be linked to their parent if they have the same last name, live at the same address (line 1 only) and the parent is 'married'. We recommend that you import your Address Book contacts first, then the children. Need some inspiration? You may find our template contact import CSV file useful. Simply download (by right-clicking the link and selecting "Save as" and then open it in Excel or another Spreadsheet program. For checkbox list Custom fields, where a person may be assigned multiple options, each option should be presented comma separated, like this example, where column C and D are both multi-select custom fields. Once you have correctly prepared CSV file and you are happy to proceed with the import, save it to your desktop and close your spreadsheet application. Back in ChurchSuite on the "Import contacts" page, click the "Choose File" button to browse to the CSV file on your desktop. 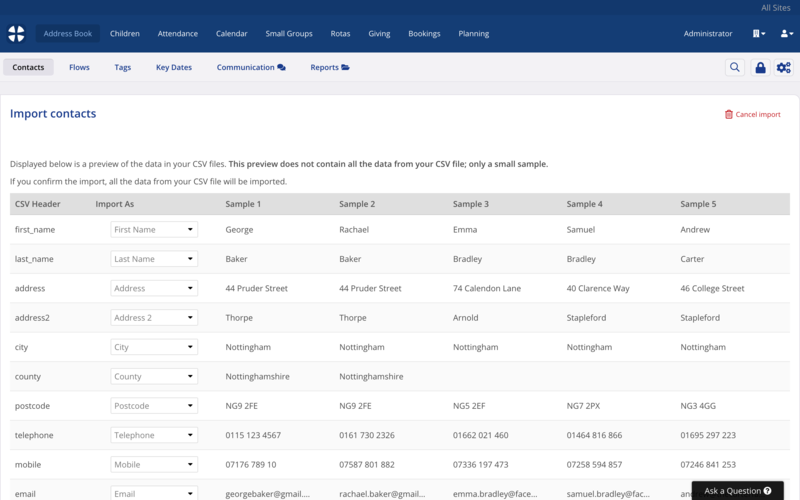 Click Import CSV File.ChurchSuite now shows a preview of your data, with examples of the first 5 records in your data. Note the CSV Header column - this can be helpful in ensuring ChurchSuite correctly maps each field in your CSV file to the correct field in ChurchSuite. By changing the Import As drop-down field you can specify which field your data should be assigned. Note that items marked with a yellow warning symbol will not be imported and require attention - either to set as Do not import, or to specify the correct field under Import As. Once completed, select Import All Records button at the bottom of the page and ChurchSuite will finish the import. 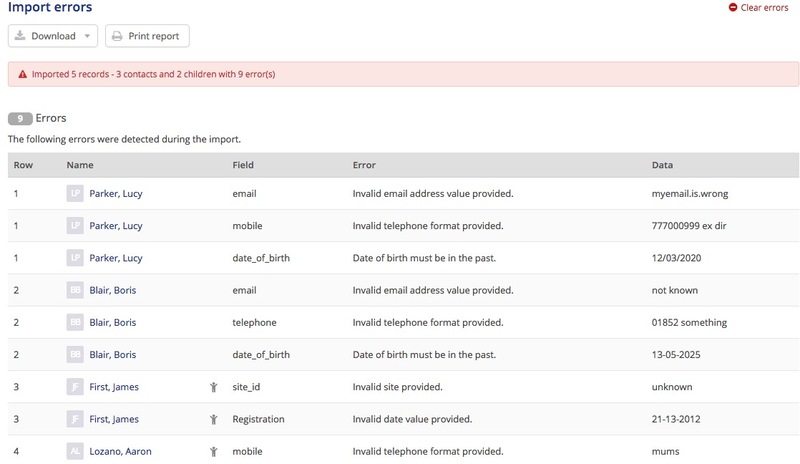 When importing contacts, children or givers, a default Tag of "Import [date and time]" is created within the respective module and assigned to the people being imported, making it easy to identify the newly imported people (and to bulk delete them if the import didn't go as expected!). You may safely delete this tag after import once you are satisfied that your imported data is correct. TIP - always start the first columns of the import file with first name and last name. This will assist in displaying the name of the person if an error is detected. ChurchSuite has a number of optional fields available for you to use. These should be enabled in the respective module's option before import. Here are the optional fields you can enable in the module's settings. If you have multiple columns of 'Tags', 'Key Dates' or 'Notes', use the special prefix (e.g. tag_Wedding) in the column header (see our example CSV file to see what this looks like). Tags may be separated by a comma e.g. 'Leader, First Aid'. The suffix name <name> must be unique e.g. tag_Role, tag_Group. The suffix name is not saved. If multiple columns of notes are to be imported, use the format 'notes_<note-name>' for each column, e.g. 'notes_Family', notes_Special'. The suffix name <name> is not saved. The prefix kd_ will be removed during import, so make the name as meaningful as possible e.g. 'kd_Wedding' will be created as a Key Date called 'Wedding'. When importing your data in to ChurchSuite (Address Book or Children), some non-UK customers may experience an issue with accented characters in their data. This will be evident when you upload your CSV file and import your contacts. In the Import preview, you may see "�" characters in place of accented characters. This issue is generally restricted to CSV files that are created using Microsoft Excel, (a known, but unresolved issue with how Excel handles characters in the UTF-8 character set), and is not a bug with the Import functionality in ChurchSuite. To work around the issue, click "cancel import" and follow the guidance below. Whilst you can still prepare your data in Excel, you will need to use alternative software to produce the final CSV export file(s) of your Excel-formatted data. For Mac we recommend using Apple's native Numbers spreadsheet application. For Windows, we suggest using OpenOffice. Each have identical functionality to Excel and will open your Excel-formatted spreadsheets. Within your alternative software, now re-save your data (or export it) in CSV format and then retry the data Import in ChurchSuite; being sure to choose your newly created CSV file. Click "import contacts" again, and check your accented characters in the import preview. If everything looks to be in order, proceed with the completing the import process. If you continue to experience difficulties, contact ChurchSuite Support and we will happily assist - we can even import your data for you. medical will be imported into the Medical field Has a serious nut allergy.